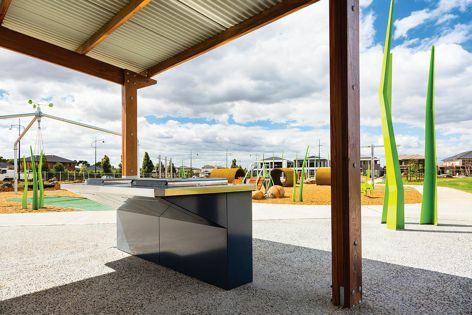 A new recreation reserve in Roxburgh Park, Victoria, features a range of Stoddart’s Town and Park street furniture solutions. 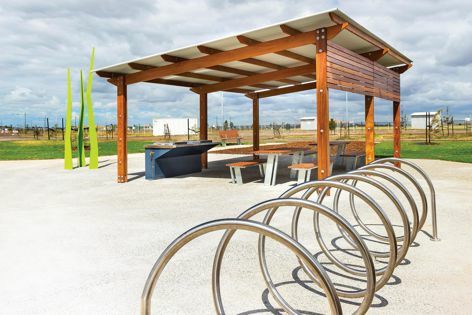 The Town and Park timber skillion shelter provides cover for a barbecue and picnic seating. Stoddart Town and Park specializes in the design and production of a suite of attractive, robust and functional pieces of street furniture that are designed with people in mind. Stoddart provided several complementary products for a new recreation reserve at the True North estate in Roxburgh Park, Victoria. Working with Spiire, Stoddart employed its timber skillion shelter design in an 8 × 6-metre configuration in merbau timber to provide cover for a double hotplate, DDA-compliant barbecue and picnic seating. Additionally, Stoddart supplied a stainless steel spiral bike hoop adjacent to the structure. On this job and in many since, Stoddart has been turned to for the supply of an entire range of products. Its in-house design and project management capabilities, on top of the quality production management at Stoddart, ensure that multifaceted projects such as this look great and provide the best solution for clients.